Do not depress the accelerator if the forward driving mode is changed when the vehicle is halted and the engine is running – there is a risk of an accident. Never shift the selector lever to R or P modes when driving – there is a risk of an accident. The vehicle must be held on the brake pedal in D, S or R modes if the vehicle is halted and the engine is running. Even when the engine is idling, power transmission is never completely interrupted – the vehicle will creep. If the selector lever is shifted to N while the vehicle is being driven you must lift off the accelerator pedal and you will need to wait until the engine has reached its idling speed before shifting the selector lever to a forward driving mode again. At temperatures below -10 °C, the engine can only be started in selector lever position P.
Never try to hold the vehicle using the accelerator pedal when stopping on a hill – this may lead to transmission damage. The ignition key can only be withdrawn once the ignition has been switched off if the selector lever is in the P position 1). 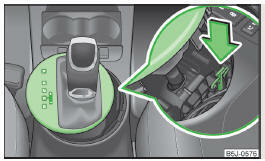 When the ignition is switched on, the gearbox mode and the gear currently selected are indicated in the display 1 » Fig. 105. The following modes can be selected with the selector lever » Fig. 105. The driven wheels are locked mechanically in this mode. Parking mode must only be selected when the vehicle is stationary. Reverse gear can only be engaged when the vehicle is stationary and the engine is at idling speed. Depress the brake pedal and simultaneously press the shiftlock in the selector lever grip before shifting to R from P or N.
Power transmission to the drive wheels is interrupted in this mode. In mode D, the forward gears are automatically changed according to the engine load, accelerator pedal actuation and driving speed. In mode S, the forward gears are shifted automatically up and down at higher engine speeds than in mode D.
The shiftlock on the selector lever grip must be pressed when moving the selector lever out of D mode into S mode. The selector lever is locked in the P and N modes to prevent the forwards travel mode from being selected accidentally and setting the vehicle in motion. in the instrument cluster » page 42. The selector lever is released by depressing the brake pedal while simultaneously pressing the locking button in the selection lever grip. The selector lever is not locked when shifted quickly through N (e.g. from R to D). This, for example, helps to rock out a vehicle that is stuck, e.g. in a bank of snow. The selector lever lock will engage if the lever is in position N for more than approximately 2 seconds without the brake pedal being depressed. The selector lever is locked only when the vehicle is stationary and at speeds up to 5 km/h. If you want to move the selector lever from mode P to mode D or vice versa, move the selector lever quickly. This prevents modes R or N from being selected accidentally. Tiptronic mode makes it possible to manually shift gears with the selector lever or multifunction steering wheel. This mode can be selected both while halted and while driving. The gear currently selected is indicated in the display 1 » Fig. 105 on page 106. Push the gear selector from position D towards the right, or left in a righthand drive vehicle. Press the selector lever forwards + » Fig. 106. Pull the right-hand paddle + » Fig. 106 briefly towards the steering wheel. Press the selector lever backwards - » Fig. 106. Pull the left-hand paddle - » Fig. 106 briefly towards the steering wheel. Pull one of the - / + paddles » Fig. 106 briefly towards the steering wheel . Manual gear shifting is deactivated if more than 1 minute passes after either of the - / + paddles was pulled. The temporary switch to manual gear shifting can also be deactivated by pulling the right-hand + paddle towards the steering wheel for more than 1 second. When accelerating, the gearbox automatically shifts up into the higher gear just before the maximum permissible engine speed is reached. If a lower gear is selected, the gearbox does not shift down until there is no risk of the engine overrevving. It may be advantageous to use manual gear shifting when driving downhill, for example. Shifting to a lower gear reduces the load on the brakes and hence brake wear » page 104, Information for braking. Firmly depress and hold the brake pedal. Press and hold the shiftlock button on the selector lever grip. Move the selector lever into the desired position » page 106 and then release the lock button. Release the brake pedal and accelerate. Fully depress and hold the brake pedal and bring the vehicle to a stop. Keep holding the brake pedal until driving is resumed. The selector lever position N does not have to be selected when stopping for a short time, such as at a cross roads. Move the selector lever to the P position and then release the shiftlock button. The kickdown function allows you to achieve maximum acceleration by your vehicle while driving. When the accelerator pedal is fully depressed, the kickdown function is activated in any forward driving mode. The gearbox shifts down one or more gears depending on the vehicle speed and engine speed, and the vehicle accelerates. The gearbox does not shift up into the highest gear until the engine has reached its maximum revolutions for this gear range. Rapid acceleration, particularly on slippery roads, can lead to loss of control of the vehicle – there is a risk of an accident. The transmission switches to the emergency programme if there is a fault in the automatic gearbox system. Only certain gears are selected. Reverse gear R cannot be used. Shifting gears in Tiptronic mode is not possible. The gearbox may, for example, become too hot due to frequent repeated starting or stop-and-go traffic. Overheating is indicated by the warning light » page 34, Clutches of the automatic DSG gearbox are too hot. Visit a specialist workshop if the gearbox has switched to the emergency programme. If the selector lever lock is defective or its power supply is interrupted (e.g. discharged vehicle battery, faulty fuse), the selector lever can no longer be moved out of position P in the normal manner, and the vehicle can no longer be driven. The selector lever emergency unlocking procedure is as follows. Carefully pull up the front left and right cover. Use a finger to press the yellow plastic part in the direction of the arrow » Fig. 107. At the same time, press the locking button in the selector lever and move the selector lever to N.
The selector lever will be locked once more if it is moved again to P.